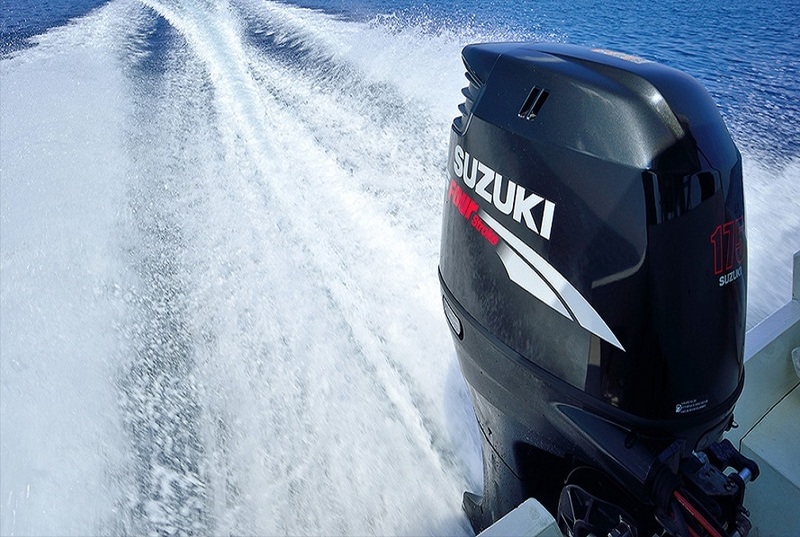 Suzuki’s four-stroke outboards have long been on the cutting edge of performance winning acclaim for their advanced technology, innovative ideas, and designs. They were the first to introduce a digital Electronic Fuel Injection four-stroke, which allowed the DF60 and DF70 to capture the IMTEC Innovation Award. Gulf Marine is an authorized retailer and service center for Suzuki Marine products. Give us a call with any questions or for any assistance. The V6 series maxes out with the award winning DF300AP, which incorporates "Suzuki Selective Rotation" - the world's first outboard that combines standard and counter-rotation operation into the same lower unit. Two-Way low water pick up inlet provides engine cooling with increased water flow. Not to be left out of the fun, the DF250AP, DF250SS, DF250 and DF225 bring powerful innovation to your fun. The In-Line 4 series starts out with the DF200A is an "In Line" four-stroke outboard is packed with technology. This four-stroke engine has large displacement, lots of torque and plenty of power. This four stroke engine is a clean runner and certified with a 3-Star Ultra-Low Emission rating from the California Air Resources Board (CARB) and has also met the EPA 2010 standard. If you need a little less power, but with the same technology, the In-Line series also offers the DF175, DF150SS, DF150, DF140A, DF115SS, DF115A, DF90A and the DF70A. The Mid-Range series cranks up the fun with the new DF60AV. It is designed with a "High Energy Rotation" lower unit sporting a 2.42:1 gear ration, which enables this new model to use a bigger 14" propeller - perfect for powering pontoon boats and other large, heavy craft. This mid-range engine is also designed with Lean Burn Fuel Control System, which adjusts the air/fuel mixtrue according to operating conditions. There is still plenty of options offered, too, with the DF60A, DF50AV, DF50A and the DF40A. The Portable series comes in plenty of sizes to fit the need for a portable. At the top of the list is the State-of-the-Art design of the new DF30A, which is the the most technically advanced portable outboard on the market today. This is the world's first 30 hp outboard motor designed with Lean Burn and Battery-Less Electronic Fuel Injection. The Suzuki EFI system operates Battery-Less, which is an industry first in this horse-power class. The DF30A is a smooth running "Next Generation" four stroke which delivers quick starts, great acceleration, awesome performance and superior fuel economy. And for those seeking a smaller footprint, you should explore a DF25A EFI, DF20A EFI, DF15A EFI, DF9.9TH, DF9.9A, DF9.9B EFI, DF6, DF4 or the DF2.5.